…is Sunday evening, July 8th at Jergels Rhythm Grille! The event not only benefits Ben’s Foundation, but also the Make-A-Wish® Foundation as well. Those attending will be rockin’ to 80’s cover band, Flashback Heart Attack, enjoy a strolling dinner, and a fabulous live and silent auction – including the chance to bid on a dinner with Ben, Brett Keisel, Mike Tomlin and Merril Hoge! WDVE‘s Randy Baumann will be the emcee for the festivities! Ben was a call-in guest on the WDVE Morning Show earlier this week to talk about his Foundation event, which you can listen to here! *If you are unable to attend, but would like to make a donation, please click here. 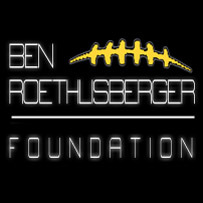 To Sue Pollard and the members of Steelers Universe for sending a $250 donation to The Ben Roethlisberger Foundation! The donations were made in memory of their founder and administrator, Marianne, who passed away in April after a long battle with cancer. ← Back from the U.K.